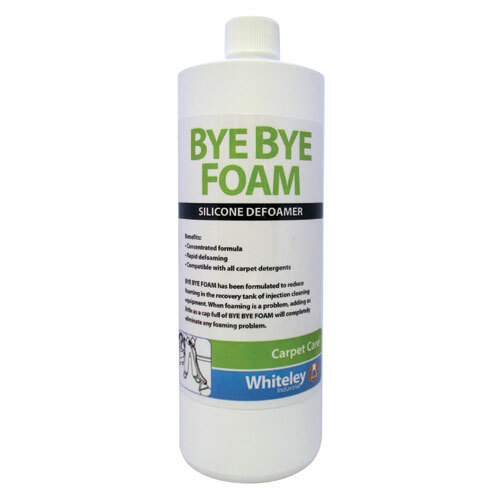 Bye Bye Foam Silicone Defoamer has been formulated to reduce foam in the recovery tank of injection cleaning equipment. When foam is a problem as little as a cap full of Bye Bye Foam will completely eliminate any foaming problem. Eliminating the presence of any foam in the recovery tank can significantly effect the speed and efficiency of any carpet cleaning operation since the recovery tank can be filled completely with water before it has to be emptied. This also eliminates the danger of any foam making its way into the pumps. The presence of excessive foaming often results from previous detergent residues being left in a carpet. Such residues may be due to previous bonnet cleaning operations or from the regular use of a high foaming domestic carpet spotting detergent. NOTE: Whiteley's carpet detergents Fabripowr and Fabripowr Plus contain a built in defoamer and will foam very little by themselves. When foaming problems are encountered it is generally because of the excessive detergent residues left behind in the carpet from previous cleaning operations. Click here for Bye Bye Foam MSDS.